In contrast, I’ve always approached Easter as a more somber time—certainly a time of ultimate triumph. But one that was preceded by the agony of Jesus on a cross. To me, Easter was when Christ laid down His life for us. Now I’ve begun to look at things a little differently. Recently, I challenged by a friend to view Christmas in a new light. She pointed out that His birth on earth was when Jesus left His Heavenly glory. The more I considered this, the more sharply I saw the contrast of His life in Heaven. I had always looked at Christmas as a gift—which it is—instead of seeing past the present to the sacrifice it must have been. Jesus’ birth truly was the time when He laid down His life for us. He exchanged Heavenly robes for swaddling garments of ragged cloth. He exchanged the chorus of angels praising him day and night with the voices of cattle in a lowly manger. He exchanged the power and authority of being God in Heaven with that of living as a helpless—fully human—baby. He exchanged the protection of angels with the dubious protection of human parents. He exchanged immortality with a life that would end in physical death. (Yes, He was fully resurrected, but He had to go through the process of living to dying to reconcile us with God). He exchanged perfect—intimate—fellowship with God for a relationship with us. I will never see Christmas the same way again. How about you? WOW! I never thought of Christmas this way. 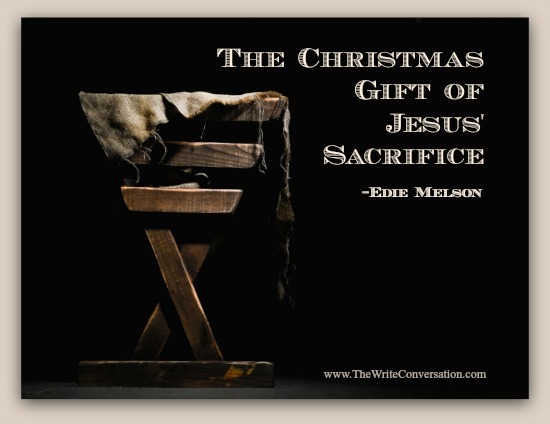 Always thought of the gift of Jesus as coming from God, but not of Jesus's sacrifice to us as well. Thank you. You have made Christmas even more special. Merry Christmas, Edie. I pondered long over this, Edie. And it cuts through all the commercialism of the holiday, to the heart of it. I don't think I'll ever think of Christmas the same again, either. Thank you for sharing it! Wow. This is amazing! Thanks so much for sharing! A God who humbles Himself and takes the form of a human child to relate to us truly deserves worship. What an intriguing new perspective on the Christmas miracle. Thank you for opening my heart to a new way of thinking. Fascinating that your thoughts actually reverse the happiness and sorrow aspects of Easter and Christmas. Really makes me think. Wonderful thoughts and reminders of the sacrifice our Heavenly Father and His Son made for us! Merry Christmas sweet friend!